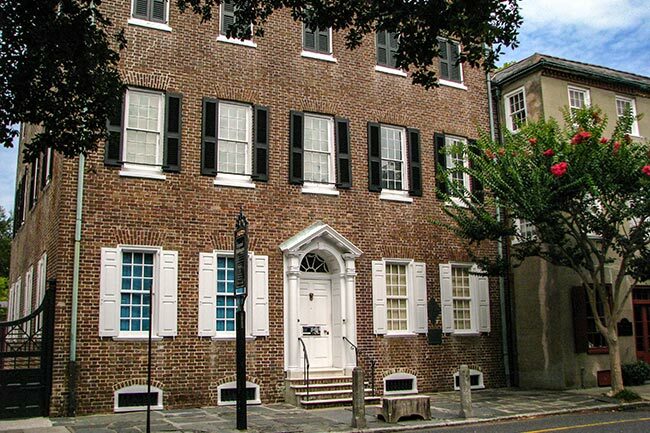 The Heyward-Washington House in historic Charleston was the city’s first house museum. 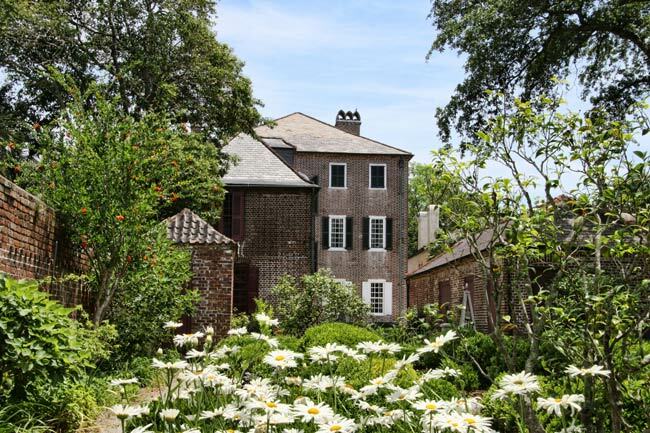 The Georgian home was built between 1770 and 1772 by rice planter Daniel Heyward for his son, Thomas Heyward. Thomas Heyward was an artillery officer in the American Revolution, and even more notably, a signer of the Declaration of Independence. President George Washington stayed here during his 1791 visit to the city. In 1929 the Charleston Museum purchased and restored the home. The museum then opened it to the public and still operates it today. Interestingly, a close replica of this house exists in the small South Carolina town of Winnsboro. There, the Ketchin Building houses the Fairfield County Historical Museum. At the turn of the century, the storied house was used as a bake shop called H.W. Fusler and Sons Bakery. The photo below faintly shows a sign in front of the shop that read “Bakery-Confectioner” (look just right of the door that stands between the two plate-glass windows). The business was owned by Henry and Wilimena Fuseler. To the rear of the home, a courtyard is created by flanking outbuildings which once were used by slaves to run the household. 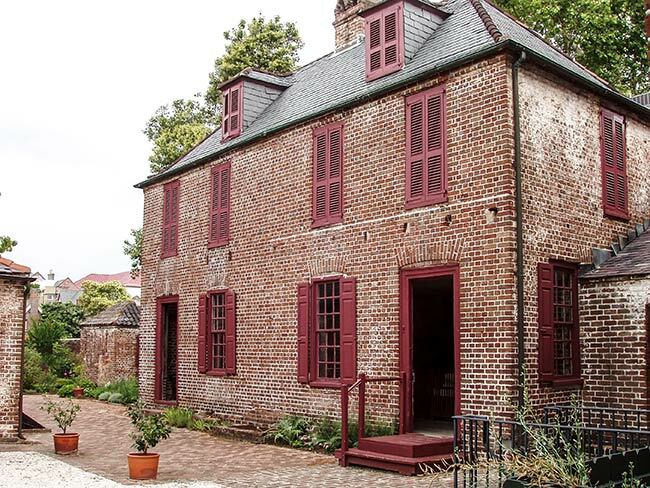 The building pictured below served as the kitchen, laundry, and slave quarters. Kitchens were located in detached buildings in order to contain a fire if one were to get out of hand. The building across from this served as the carriage house; a formal garden sits beyond the outbuildings. 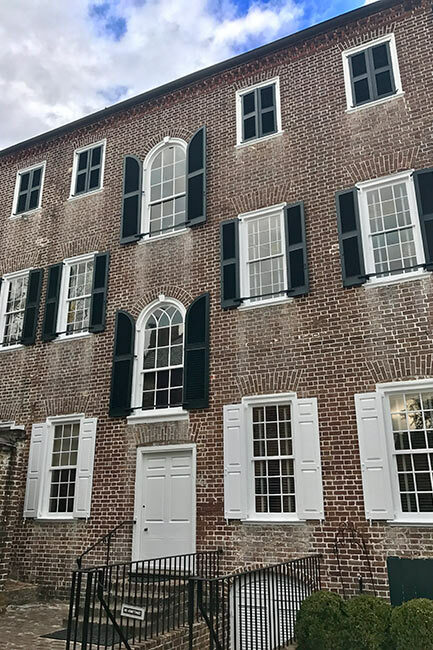 The Heyward-Washington House is a very fine three-story brick Charleston “double house” which commemorates the residence of Thomas Heyward, Jr., one of the signers of the Declaration of Independence. 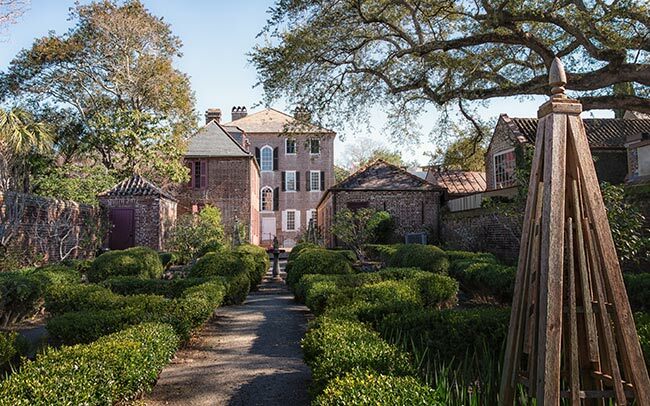 Built in 1770-71 and acquired by Thomas Heyward, Jr. from his father in 1777, the house was implicitly deemed outstandingly worthy when chosen in 1791 to shelter President Washington when he visited the city on his Southern tour that year. 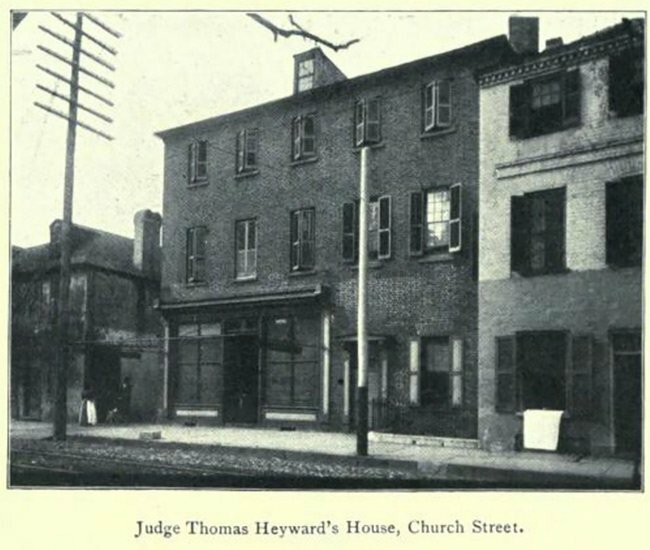 Since then, the house has been called the Heyward-Washington House. Heyward was born in 1746 in Jasper County, South Carolina, the eldest son of one of the wealthiest rice planters of South Carolina. He was one of five delegates from South Carolina sent to the Second Continental Congress in 1776, signed the Declaration of Independence, and served in Congress until the end of 1778 when he returned to his home state to become a circuit judge. The house presents a massive block appearance since it is nearly square in plan and has a low pitched hipped roof pierced by only a single dormer on the street front. The high chimneys are corbeled, and all windows are topped by brick jack arches. 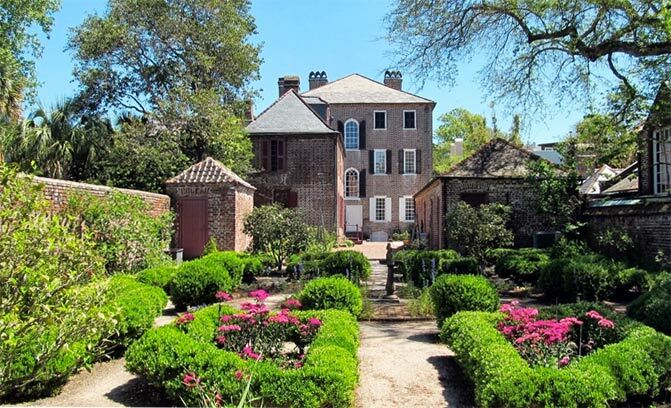 It is one of the largest of the early houses of Charleston. The “double house” plan is a local name used to identify the common Georgian “four room” or “center hall” floor plan. At the rear (west) of the house is a little courtyard, formed by the house, a kitchen/laundry/servant’s quarters building, and a carriage house. Further west is a small formal garden of the type popular in the late 18th century. 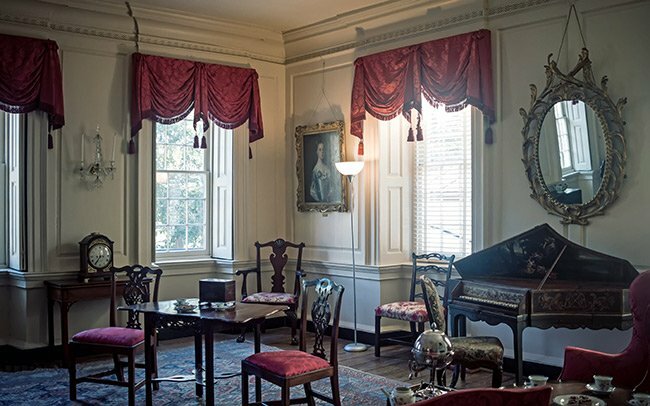 The image immediately below shows the drawing room at the Heyward-Washington House. Antique, Charleston-made furnishings from the 18th and 19th centuries decorate the room. 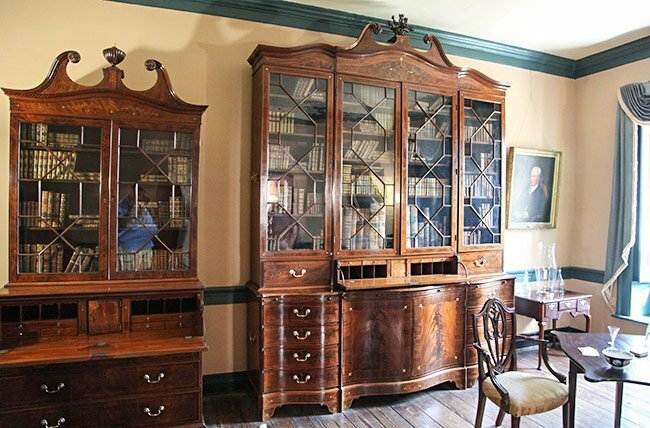 Considered one of the finest examples of American colonial furniture, the Holmes-Edwards Bookcase is located in the withdrawing room of the house. Built between 1770 and 1775, the bookcase was likely constructed by Martin Pfeninger for John Edwards of 15 Meeting Street. The bookcase descended through the family when Edwards’ daughter, Elizabeth, married John Bee Holmes. 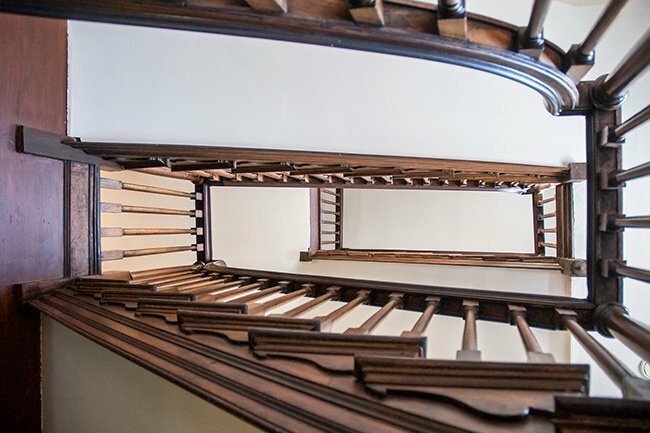 The fine staircase of the Heyward-Washington house is accessed from the home’s central stairwell, behind an arched doorway. The staircase services every level of the house. I am a native of Charleston. I remember visiting this museum.